This quality tour is offered and operated by Hit Iceland to Landmannalaugar from Reykjavík city and back. It is a journey to some of the most impressive landscape and exciting attractions in Iceland, and possibly one of the most breathtaking places on the planet. Our specialties are natural wonders and inspiring places in Icelandic nature and places of historical and geological importance. If you want to get the most out of a day tour with a knowledgeable local expert on Iceland by your side in a new modified 4X4 vehicle this is your tour. It is a minimum of two passengers and max four passengers, so it is a kind of a private tour. We also have two extra seats for children (age 8 - 15) and do torus to Landmannalaugar for larger groups. If you have a larger group than 4 please contact us at info@hiticeland.com. The tour is a visit to the highland and we go to one of the most captivating places you can find in Iceland. Our tour purpose is to convey and show you natural wonders, the beauty, the landform, geology, landscape, and the feeling you experience when you are close to natural wonders. The tour is offered from the time Landmannalaugar road opens in spring, usually the middle of June, until late September when the snow starts to fall. During winter everything in Landmannalaugar and the highland in Iceland is covered with snow and not particularly interesting. One option that is part of the tour is a short hike with your guide. At the top you will get a spectacular view of the rhyolite mountains, hot springs, and colorful landscape. 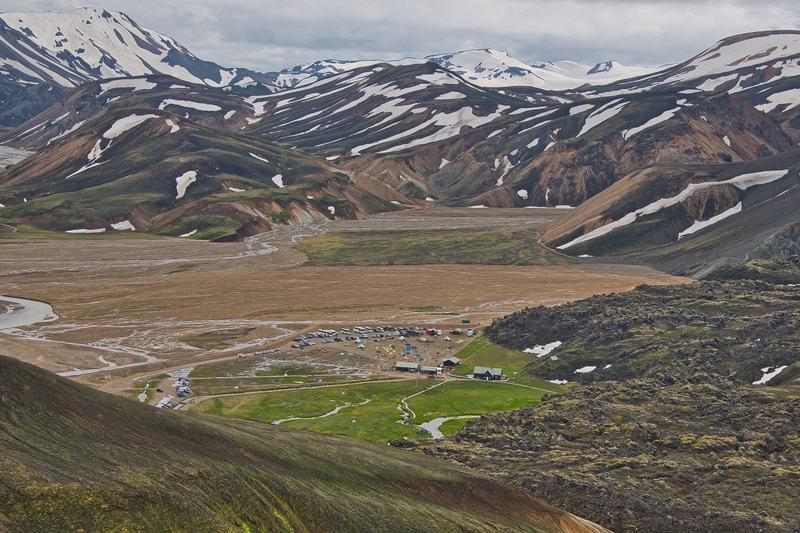 What can we tell you about Landmannalaugar? Landmannalaugar is perhaps better described as an area of excotic landscape rather than a place. In essence, it is the northernmost part of the spectacular and unique volcanic system Torfajökull best known for its rhyolite mountains. It is a vast region in the highland with many different hiking trails, mysterious and colorful valleys, warm creeks mixed with geothermal water, glacial rivers, spring-fed rivers, geothermal pool, volcanos, lava fields, and mountain peaks with stunning views towards impressive hot springs and rhyolite mountains of many different colors. 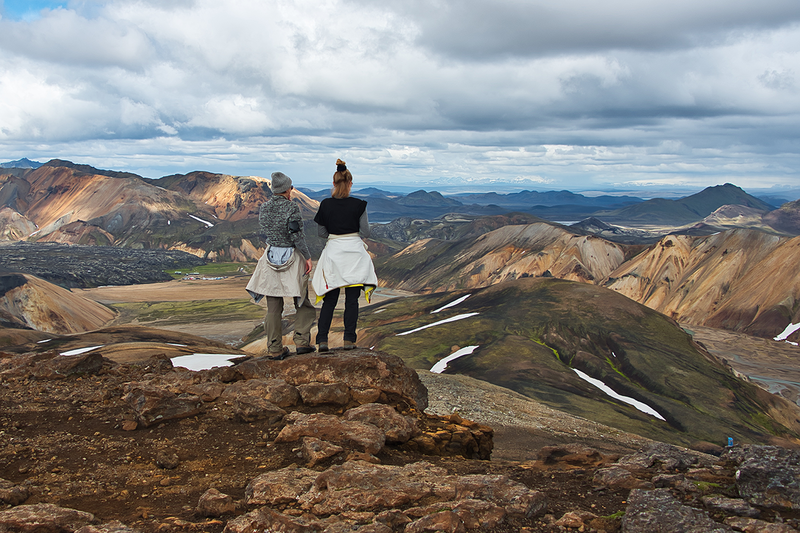 In Landmannalaugar you can explore, hike, relax and experience. You can also experience a walk through a mysterious small valley with small hot springs all around you. If you are interested in photography, the motives and landscape to capture are endless. In Landmannalaugar you can place yourself in a unique spot and easily find your private sanctuary among the magnificent colors of rhyolite mountains as you walk some of the beautiful Landmannalaugar tracks. The Hit Iceland tour is a perfect way to learn about Landmannalaugar, to understand what the highland is all about, and how to drive on F roads. What is there to see along the way to and from Landmannalaugar? The drive to Landmannalaugar is a scenic drive through a continually changing landform. As one of our passengers told us; it is like driving from one painting to another, but all very different. A drive through beautiful farmlands to a black sand wasteland. Along the way, we visit one of the most beautiful canyons the highland, Sigöldugljúfur, known for its many small and spectacular spring-fed waterfalls. It is a stop that usually takes peoples breath away, and the reaction is often a double wow. 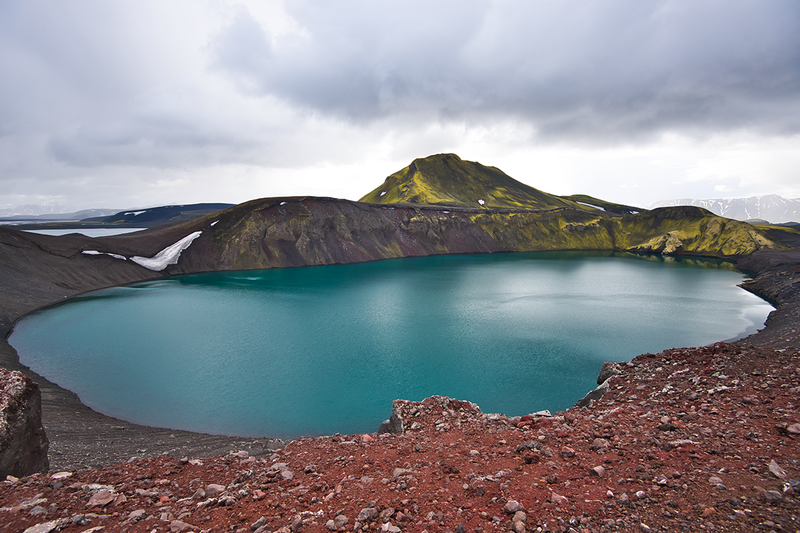 We also stop by a stunning volcanic crater, a maar or an explosion crater as it is called in Icelandic. Like Sigöldugljúfur it is a spectacular site and one of only a few you can find in Iceland. We also make a short stop at Frostastaðarvatn lake near Landmannalaugar. And on our way back we drive through the lava fields of Dómadalur valley and by the volcano Hekla, one of the most active volcanos in Iceland for many centuries. It is a tour of wow, ooh, gosh, and stunning. The tour starts in Reykjavík and takes you along the south coast through Selfoss town and then straight to the edge of the highland. 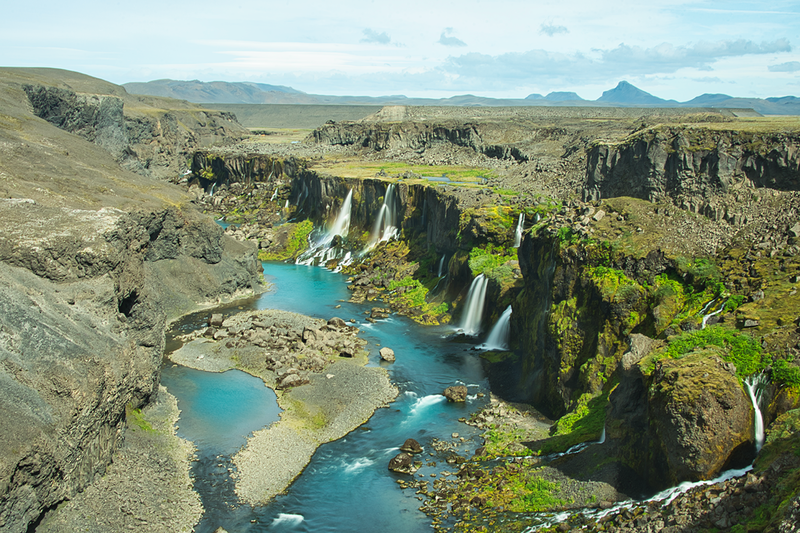 Our first stop, around 11AM in the morning, is about one and a half hour drive by the magnificent small waterfalls in Sigöldugljúfur canyon. The canyon is among the most photogenic places in Iceland but not visited by many. From Sigöldugljúfur we drive through a large lava field up on the Hnausapollur volcanic crater with its turquoise colored small lake. After Hnausapollur explosion crater if conditions are good, we climb the rugged 4x4 hill to Ugly Pond or Ljótipollur crater with its magnificent highland view. By the crater, you have a great view over a significant part of the highland. After viewing the crater and admiring the landscape, we continue the short distance towards the mountains around Landmannalaugar crossing rivers and stopping at the service center. We arrive around 12:30 or 12:30PM, a good time for a light lunch and our stop in Landmannalaugar is about three and a half hour. 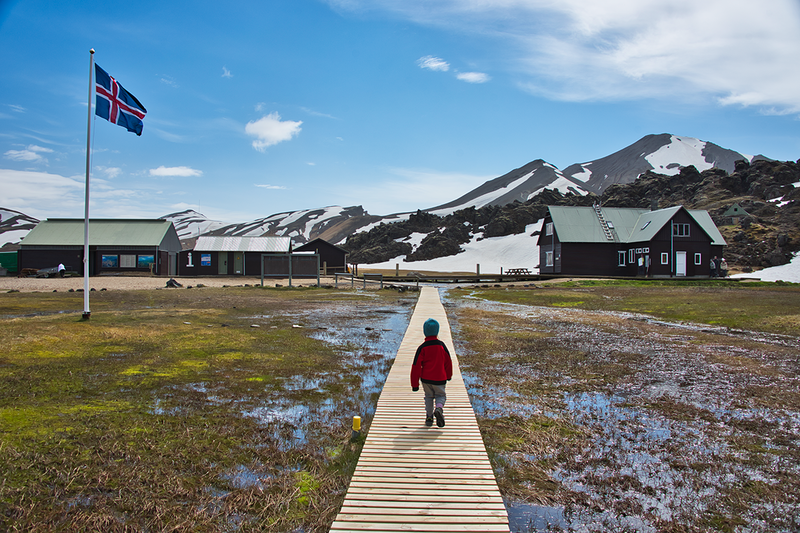 When we arrive in Landmannalaugar, we stop by the service center, and it is an excellent opportunity to take a short hike with your guide, preferably the Laugahringur or the Landmannalaugar lava field circle. It is a short hike that takes you through the intersting lava that flooded from Brennisteinsalda volcano in the late 15th century, smoking hot springs, geothermal/sulfur steam, and the small colorful ravine Grænagil (Green ravine). 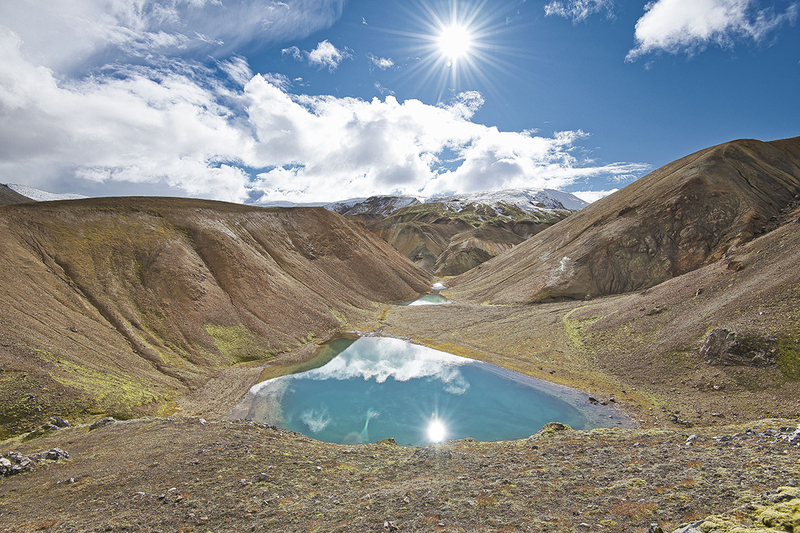 The 4 km hike and an elevation of about 100 meters take roughly an hour and is a breathtaking introduction to the kind of landforms and landscape you encounter in the Landmannalaugar area. There is also the option to go for the top of Brennisteinsalda volcano, which takes about an hour and a half more, but is a peak of exceptional 360 degrees view to a vast part of the Icelandic highland. The Brennisteinsalda hike is an addition to the Laugahringur hike and is about 7 kilometers and an elevation of 300 meters. A stunning walk, relatively easy and a triple wow at the top. 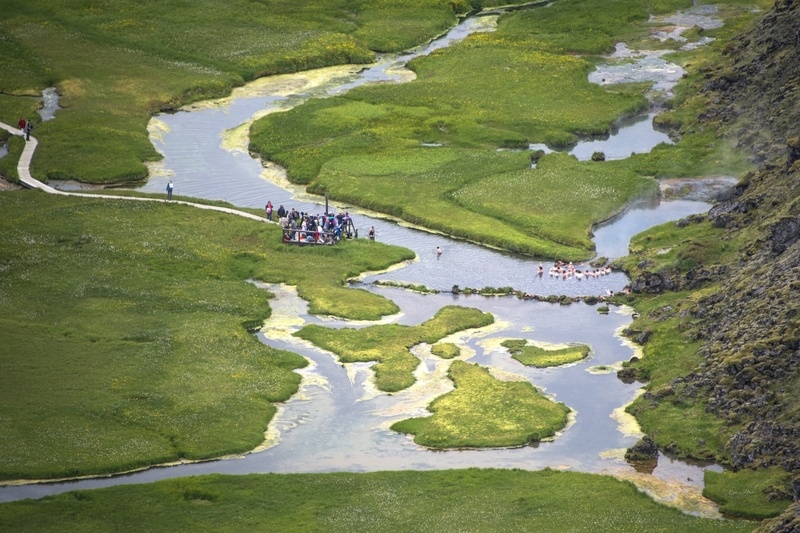 And last but not least you can dip into the famous Landmannalaugar geothermal, natural pool. So it is essential to bring hiking shoes and a small backpack with a bottle of water and sandwiches or light lunch and some snacks as well as a towel and swimming suite to enjoy this stop to it fullest. From Landmannalaugar we continue our tour around 3 PM or 15:00, depending on activity. We begin by driving through the scenic drive Dómadalur valley. The drive takes us through some magnificent landscape typical for the Icelandic highland. Vast fields of lava, small lakes, mountains, volcanoes, rivers, creeks and a 4X4 highland road. A landform often referred to as moon-like landscape. No wonder it was one of the filming locations at Ridleys Scott Prometheus. It is a magical scenic drive that ends by the volcano Hekla that could display one of its small eruptions at any time, according to geologists. We will stop once or twice just to take a photo and inhale the amazing moment of being in the highland. A once in a lifetime experience? For most people this tour is a once in a lifetime experience. It is an opportunity to visit some of the most remarkable natural wonders in Iceland in a relaxed and convenient way in a new properly equipped and modified 4X4 Toyota vehicle. You are traveling like the locals do in the highland. It is also a scenic drive loaded with information from your guide, Einar Páll Svavarsson owner and creator of Hit Iceland, about the geology and geography of Iceland as well as our history. 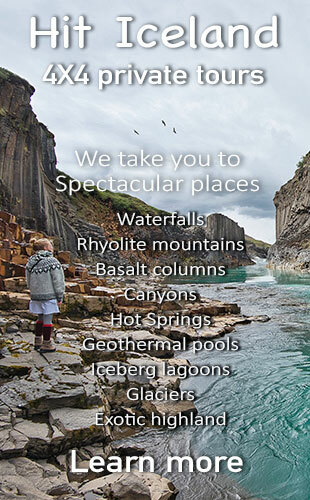 You will see and experience some of the most remarkable landforms on the planet as well as magnificent waterfalls. And you will get infinite number of photo opportunities whether you are a professional photographer or just taking a selfie. 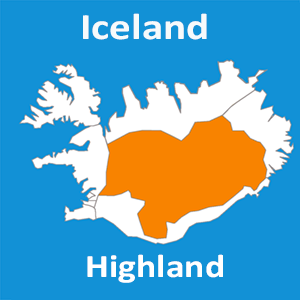 A highly experienced Icelandic local driver guide with extensive knowledge about Iceland, geology, the country, people, history, and more importantly with years of experience driving on F highland roads in Iceland. A brand new (2019 model) modified convenient 4X4 Toyota Land Cruiser fit for F road driving and river crossing. A drive to some of the most interesting places in Iceland. A hiking tour with a guide around Laugahraun lava field and up to the volcano Brennisteinsalda. A dip into a Natural Geothermal Pool (the real thing - not man made like the Blue Lagoon). Hiking shoes or similar, swimsuit, a towel and a camera. It is also a good idea to bring warm clothes, preferably rain resistant and a small daytour backpack. You should bring some snacks for the day and a small lunch like a sandwich. Remember that we are in the highland where there is limited service for a long part of the tour. 7:45 - 8:00 in the morning at a location, street or hotel, in the Reykjavík capital area that you put in during the booking process. We also pick up at Hveragerði town and Selfoss town. If you are ready for this amazing experience of visiting magnificent places and natural wonders book your tour and dive into the adventure with HIT ICELAND. This was an amazing experience for my wife and I as first-time visitors to Iceland. I'm a photographer that wanted to see the beauty of Iceland in the Highlands. Einar, our host guide, was amazing and made the visit to Landmannallaugar a trip to remember. Einar was extremely knowledgeable of the area and full of information relevant to our trip. He took us places that otherwise would have been impossible for us to find and photograph. Having looked at other adventure trips into the Highland, this one far exceeded our expectations with a cost component far better than other service providers. I highly recommend this tour with Einar to everyone wanting to get visit Landmannalogugar. Amazing! We got a nice guide who new the most beautiful hidden places where nobody else stopped. And they were really worth seeiing. We enjoyed litteraly every minute of the tour to landmannalaugar. This trip was the highlight of our trip to Iceland. We had a great time with Einar, who picked us on time at our hotel and had a pleasant conversation during our drive. Einar is quite knowledgeable about Icelandic culture and history and shared many stories. Took us off the beaten path to see spectacular sights. This trip was the highlight of our trip to Iceland. Lo descubrí casualmente y la experiencia fue excelente, Einar con su excelente atención y conocimiento de la zona, hizo que la jornada fuera inolvidable, nos enseñó rincones que no hubiéramos conocido sin el y nos acompañó durante el paseo que dimos dándonos detalles de lo que visitábamos. Muy recomendable. Einar was full of information, and took us to some really beautiful places as well as the Landmannalaugar area. My wife and I took this tour on our last full day in Iceland, and were lucky to have a personal tout on the day with just the two of us. Einar was full of information, and took us to some really beautiful places, that were tourist free, as well as the Landmannalaugar area. 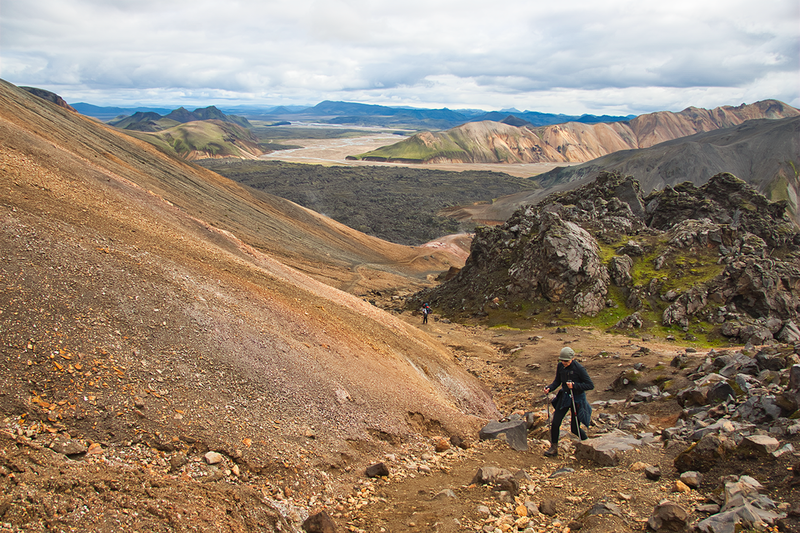 The tour is very spectacular, and the walk up the trail as Landmannalaugar is really spectacular. My only advice is to wear good walking shoes, as the terrain can be a bit precarious at the top of the mountain. Some people took walking poles, we didn't have any so we didn't and still made it ok. The trail to the top of the sandy coloured mountain is about 7km. Be sure to take warm layers of clothing, and your camera. A mobile phone is a good start, but a DSLR is better as the views are quite unique to this area. The mountains are colourful from the various minerals including obsidian, we saw shades of green, blue, orange, red, black and yellow, all of which changed with the varying levels of light. I went on a similar tour 10 years ago, and saw new things on this trip that I had not read about in tourist guides elsewhere. We had an unforgettable trip with Einar to Landmannalaugar! We stayed in Selfoss, so Einar was so friendly to pick us up at our house there. There was no one else, so it was a real private tour for us (3 people). It was a beautiful sunny day after a lot of rain, so the colourful mountains were amazing. Einar showed us three beautiful spots before we arrived at Landmannalaugar. Because of the good weather we did a 2,5 hour hike up the mountain with him. Amazing views at the top. Then there was time to take a bath in the hot pool (bring your swimwear!). Then we drove back. Einar told us many things about the landscape, the vulcanoes, and gave us tips which places we should visit in Iceland. We had an amazing day with him, later on he sent us some pictures he took during the trip. Thank you Einar! The Highlands tour was one of the highlights of our trip to Iceland — a truly remarkable experience. Einar was knowledgeable and a fantastic guide. Highly recommended! This day tour was perfect!. The most complete and not most expensive day tour, comparared with those proposed by other companies A private tour (max 4 persons) for a very reasonable price. In a very comfortable and spacious jeep, Einar, guide and founder of Hit Iceland company, who has spent most of his childhood in Landmannalaugar. will give you much information as possible on this site ( he is also a journalist). In summary: a trek in lava fields, a bath in a natural hot pool, a volcano crater, waterfalls .... make this day a memorable day! Our tour with Einar was a really outmost experience. We choose the one day "Landmannalaugar highland adventure & Geothermal Pool tour". We were the only 2 participants so it was a real "private" tour ! Einar was so kind to pick us up at our place in Reykjavík even if on a short notice. The tour was great, full of explanations and nice chats. Landscapes are gorgeous, Landmannalaugar is for sure a not to miss place. Einar came also with us during a short (abt. 2 hrs) hike up to Brennisteinsalda volcano: breathtaking ! The short dip in the pools at the end was as well great ! Worth the price, I would definitely reccomend it! Thank you again Einar and warmest regards to your daughter as well ! It was a wonderful experience. The guid was very patient and had good knowledge about the area. It was a nice private tour to have in iceland. The place was awsome. Very nice tour with Einar, who is very knowledgeable. Told us a lot about Island and the geology around. We saw many spectacular views. Very god value for money:-) I can only recommend this tour / operator. This was one of the highlights of our trip! We traveled in a truck with 2 other travellers. Our guide, Einar, was very knowledgeable about Icelandic history and the area which made the experience even better. On the way into the highlands, we stopped at a river canyon and a crater lake which were absolutely stunning. At Landmannalauger, we hiked through lava fields and up the the volcano peak. The views were surreal! Afterwards, we got to take a dip in the hot spring at the base. I felt that this was a much more personalized experience than a large group tour, and I highly recommend it to anyone wanting to visit the highlands. Beautiful place. Just as enjoyable is the trip with Einar, whose love for and knowledge of Iceland is worth the cost of the trip. Truly a wonderful experience. Highly recommended! It’s a mind blowing experience to have visited one of the most remote and remarkable natural wonders in Iceland. Every single view is unbelievably amazing! Most lucky to have found an experienced guide Einar who drove us safely to Landmannalaugar. Along the way we enjoyed stunning views of large lava fields, volcanic crater and magnificent waterfalls. We took a much longer hike in the highlands through impressive hot springs and rhyolite mountains of many different colors. Einar was kind enough to introduce us to more of Landmannalaugar by extending our hiking from 2 hours to 4 hours at no extra cost. All of us returned back to Reykjavik happily exhausted :) Thank you!! This tour was a wonderful start to our 10 day long trip to Iceland. We covered a lot of ground and got to see some breathtaking views. Einar also provided us with some very interesting background into the history of Iceland. All in all, this tour was just as advertised and vastly exceeded our expectations. Highly recommended ! Our experience with Hit Iceland and Einar was very good. Landmannalaugar is a very beautiful place along with many interesting spots to see on the way. Einar was a very friendly and informative guide. Overall it was an excellant tour. Despite the not so good weather, I find my journey extraordinary because of what the landscape you visit with your own eyes. Plus with Einar (our guide) he's been giving a lot of good knowledge about Iceland. And I love the fact that this tour doesn't force you to pay for the whole 4 peoples if you have only 1 or 2..